In light of Solo: A Star Wars Story I thought it would be fun to go back to the Legends line and read some of the books that deal with the character’s origin and his homeward. Having recently read Brian Daley’s trilogy for Aggressive Negotiations, A.C. Crispin’s trilogy felt like the right place to begin. What is really fascinating is reading this book post-Solo. There are some things here that feel very familiar. Han’s life on Corellia has a lot of similarities to the movie and I feel like it’s well done here in the book. It does a good job of beginning to show us why Han is so “solo”. I will say him having a wookiee raise him was a bit on the nose. I was also a little disappointed to find out that Solo was not an orphan but related to a well-to-do family on Corellia. The Paradise Snare is a mixed bag for me. The Han we get in this story seemed a bit too much like the one we know from A New Hope and therefore his arc to becoming the man who will live up to his last name does not seem as pronounced as I’d like it to be. On the other side, seeing the way he gets to the Imperial Academy was great. Far from the Empire being seen as the bad guys, it was neat to see how people think of the Academy and being part of the Empire is a good thing at this point in time. This point of view, in light of the end of Revenge of the Sith, still works well. The part of the book I like the best is the way it shows us the galaxy outside the Rebellion/Imperial conflict. Seeing the cartels like the Hutts, the spice trade and the seedier parts of Star Wars opens up so many story-telling opportunities. It also uses Daley’s ideas about the Corporate Authority in that, these crime syndicates are another major faction in what is happening between the Prequels and Originals. The goal of these reviews will not be spoilers or to get into every single detail, but more to give an overview of my impressions looking back on something with all the knowledge of canon. The fun thing for me is I’ve not read these books and it’s enjoyable to see just how much of what is canon now references works such as this. I’d rate the The Paradise Snare 3 1/2 out 5 stars. Worth going back and reading. This entry was posted in Book Reviews, Books, Han Solo, Solo: A Star Wars Story, Star Wars, Uncategorized and tagged Book Reviews, Books, Han Solo, Solo, Solo: A Star Wars Story, Star Wars, Star Wars books on June 3, 2018 by mrushing02. This review first appeared on The Star Wars Report. As Solo: A Star Wars Story approaches, Del Rey books sets the stage with Last Shot, a Han, Chewie and Lando adventure set in the period surrounding the new movie and continuing their stories post-Return of the Jedi. What follows is an adventure as outlandish as you’d expect from scoundrels such as these. One of the hardest things to do as we get older is to move on and grow. Daniel José Older digs into this theme for Han and Lando in his post-Return of the Jedi portion of the book, exploring what it means for them to develop into more mature people. For Han, he’s finding marriage and fatherhood to be a lot harder than he imagined. Nothing in his life has prepared him for how to perform either of these roles, and he’s certainly not had any good role models to look to. When he’s away from his family, there’s an intense longing to be with Leia and Ben again, yet when he’s at home, he struggles with feeling like everything he does is wrong. Older does a wonderful job of showing how difficult it is to make this kind of transition in life, to find a way through the adjustment period and develop the patience that is required from both you and your partner along the way. This is the strongest part of the book, as we witness Han take this emotional journey and come out the other side stronger for finally confronting his feelings and being willing to at least attempt to share them with Leia. Lando’s journey is similar to Han’s. He’s finally found someone who causes him to think about settling down, and that has him scared. How does he put aside the scoundrel persona for something more stable? Is it possible to embody a little bit of both? With Lando, his characterization does feel a bit more like the comedic caricature that’s become prominent in things like The Freemaker Adventures or Robot Chicken, but Older uses this to show who Lando was, giving the character an arc. What Older does so well is use the stories from the past to show who Han and Lando were and the seeds in their lives that have led them to be who they are becoming. It is a good reminder that for us to grow, it is our responsibility to learn from the past, using those experiences to push us forward and not letting fear keep us in our old routines. As one would hope from a book staring Lando and Han, the story is fun. There is plenty of great banter and the book offers a unique plot that fits the characters. It’s structured into chapters that alternate between the post-Return of the Jedi story, Lando’s past, which takes place before Solo, Han’s past which is set after Solo, and our villain’s past, which seems to be set sometime before Solo as well. For the most part the book is well written. There are some times when the writing style, especially in the dialogue, feels much toomodern, which may take some readers out of the story. The style can also make it difficult to keep track of the action, but neither of these issues outweighs the positives of such an enjoyable romp through the galaxy with our favorite nerf herders. There is so much more that could be added to this review, but honestly, it’s best left to you to enjoy in the story! This book will leave you energized for Solo and wanting more books like this. Last Shot is rated 4 out of 5 stars. This entry was posted in Book Reviews, Books, Solo: A Star Wars Story, Star Wars, Uncategorized and tagged Book Reviews, Books, Han Solo, Lando, Solo, Star Wars, Star Wars books on April 17, 2018 by mrushing02. This review originally appeared on the Star Wars Report. Novelizations for films can be two things, they can be straight adaptations of a film or they can bring context to the movie in ways that only a book can. Star Wars has a good history of this with some of it’s novelizations, Revenge of the Sith and Rogue One both being prime examples. Each allowed the reader to go deeper into the characters thoughts, expand scenes or even add new scenes that gave even more connective tissue to the surrounding scenes or material outside the film with comics, short stories or other novels. The release of The Last Jedi‘s novelization has followed in the footsteps of the aforementioned Revenge of the Sith or Rogue One novelizations and expanded on the movie to give readers an even fuller understanding of characters thoughts, motivations and whole new scenes. Jason Fry’s Star Wars pedigree is unquestionable and his work on atlas’, visual guides, short stories, novels and much more speaks for itself. Therefore he was an inspired choice to write The Last Jedi‘s expanded novelization. What really works here is the way he’s able to incorporate the ancillary materials, comics, novels, young adult books which are all represented in some way, helping to make everything that came out in the Journey to The Last Jedi feel cohesive. A specific example is the way Rose’s story in Cobalt Squadron is used to play directly into Holdo’s plan and the reason the escape craft will be invisible to the First Order. This is just one instance, but Fry weaves many of these throughout the book and they enhance the experience, especially for those who have read most of these ancillary works. Other expansions are the added scenes. There are two that really stuck out, one is the funeral for Han at the beginning of the book. It slowed down this part of the story and instead of it being a detriment, it was a blessing. Have that feeling that this was not just seconds after the end of The Force Awakens helped with the flow, that there was time for Rey to travel to Ahch-T0 and that the Resistance would actually be able to evacuate their base. The second added scene comes at the very end as the Falcon escapes Crait. Leia makes her way to the cockpit and has a hauntingly beautiful moment with Chewie as they break down over the loss of Han, Luke and Ben. It’s powerful and honestly should have been in the film. Some of this added material seemed to make this reviewer’s issues with the film even more complicated. There is a moment with Luke, as he’s on his way to Rey’s hut and when he get’s there he’s going to announce his intention to leave with her, which is amazing! Then, he gets to the hut and of course if one has seen the movie, he blows up the hut and goes right back to refusing to leave. The two scenes just don’t seem to flow together at all. One plus is that we learn more about what Luke had been up to in the period between the two trilogies. Sadly, the impression we are left with as to why Luke restarted the Jedi Order leaves a lot to be desired. Luke still feels as incongruous with who he is at the end of Return of the Jedi if not more so with the revelations the novel gives us. Fry adds a lot to the story but in the end, he can’t change the foundation of the film so it can only help so much. For those that liked or loved The Last Jedi this is a must read. If you didn’t like the movie, Fry’s ability to weave in so many references from other works makes this worth your time. And, in fact, he blew this review’s mind with a rumination Hux has about the Jedi and their link to the First Order stormtroopers. The novelization is rated 3 out of 5 stars. This entry was posted in Book Reviews, Books, Star Wars, The Last Jedi, Uncategorized and tagged Book Reviews, Books, Jason Fry, Star Wars, Star Wars books, The Last Jedi on March 9, 2018 by mrushing02. It is an understatement to say that Star Wars has revolutionized the film industry but it’s impact didn’t stop there. It’s something that has ingrained itself into cultures all over the world. As the movie celebrates it’s 40th anniversary, Del Rey books has released a collection of 40 stories by 43 different authors to commemorate the occasion called From a Certain Point of View. The format of the book is not just a random anthology of stories that all take place around A New Hope, but a systematic and chronological compilation. Each vignette tells the story of A New Hope from the perspective of people in the background of the movie. Side characters, aliens, creatures, and droids all have their parts expounded upon to create a rich tapestry in, through and around the film. Each entry ranges in length and quality. As is to be expected with 40 stories by so many different authors, some will work better than others. Part of this will be individual, as each person will respond to specific stories based on where their fandom is the strongest in the saga. As mentioned above, the highlights of this volume are sure to vary but these are the ones that worked best for this reviewer. The Red One by Rae Carson was an early favorite, telling the story of R5-D4. Rae gives us a look inside how this little droid saves the galaxy through their unselfish act. Master and Apprentice by Claudia Grey is phenomenal. It’s a dream come true to finally see the interaction of Obi-Wan and Qui-Gon during the long exile on Tatooine. It highlights just how special Old Ben is and why Star Wars fans deserve a book by Grey about these two during Obi-Wan’s time as a padawan, possibly even their adventures on Mandalore with Satine. The Secrets of Long Snoot by Delilah S. Dawson continues to cement her legacy as a Star Wars author. The same devotion and care that went into her Bazine Netal story, The Perfect Weapon is on display here (not to mention her making Phasma one of the most fascinating characters of the sequel trilogy). Garindan ezz Zavor emerges from these few short pages as a fully rounded character and it’s Dawson’s skill that makes this possible. Eclipse by Madeleine Roux is greatly helped by the recent book Leia, Princess of Alderaan, which gave readers much needed insight into the Organas and Alderaan. This short story tells the final moments for Breha and Bail Organa and it’s difficult not to get a bit teary reading about the last time we’ll see these two. Verge of Greatness by Pablo Hidalgo uses Rogue One to perfection to explain how the ghost of Krennic haunts Tarkin, making his time on the Death Star much less triumphant that he anticipated. Time of Death by Cavan Scott receives the highest marks this reviewer can give. Scott tells of Obi-Wan’s last battle and his transition into the force. It’s recommended that the reader have tissues available while reading this one. Stories receiving honorable mention are There is Another, Palpatine, Desert Son, Contingency Plan, The Angle, and By Whatever Sun. From a Certain Point of View is a fantastic way to celebrate 40 years of Star Wars and it leaves readers with the hope that each film in the series would be given this same treatment. This books is rated 4 out of 5 destroyed Death Stars. This review was completed using a copy of From a Certain Point of View provided by Del Rey. This entry was posted in Book Reviews, Books, Star Wars, Uncategorized and tagged A New Hope, Book Reviews, Books, literature, Star Wars, Star Wars books on October 15, 2017 by mrushing02. Listen to The 602 Club review here! Leia is one of the most recognized and revered characters in film, yet we still know very little about her upbringing. From the time she was whisked away by Bail Organa, adopted by he and his wife and then shows up in A New Hope, we know almost nothing (we do know just a bit more now, thanks to an appearance by the rebellious princess in Star Wars Rebels). Now thanks to The Journey to Star Wars: The Last Jedi and Claudia Gray, Leia’s transition from princess to rebel is now complete. When Star Wars premiered over 40 years ago, the rebellion was more an ideal in the film. Even throughout the next two movies, the cost to those involved was never fully fleshed out. Leia is one of the characters that suffers most from this. She looses her whole planet and we never see the impact that has on her, at least on screen (it is seen in the Leia comic that came out a couple of years ago). One of the highlights of Leia is the way Gray is able to explore the risks involved for people like Bail and Breha Organa in helping create a uprising against the Empire. The costs for them will be high if they are found to be peddling “treason” to the masses. Bail and Breha know that they are putting their lives and the life of their daughter on the line. In fact, through most of the book, Bail is insistent that Leia be kept in the dark about their defiant activities, with the slim hope that Leia might be spared by the Empire if they are discovered. Freedom is never free. Bail finally resigns himself to the fact that Leia will never be safe, even if she is not involved. The Empire will make an example of them no matter what, if he and Breha are caught, so they might as well allow Leia to be involved. Star Wars has done an excellent job recently of bringing to life the cost being involved in the Rebellion through Star Wars Rebels, Rogue One, Twilight Company and now in Leia. Another price that we see in A New Hope is the annihilation of Alderaan. That loss has never feel so great till now. Gray does a magnificent job of creating a vibrant society and planet that is the jewel of the Empire, free, open and beautiful. The Organas are not just putting their lives in danger, they are risking their whole planet. If their insurgent activities are uncovered, the Alderaan that is will cease to exist. It’s eventual destruction is more poignant now that Claudia Gray enlivened it in the pages of her book. It’s a relevant point, even today. The more we are driven apart into our little tribes and groups the harder it is to benefit the whole. Making those connections, finding common ground and coming together are the only way to make a difference. This book is under the Journey to Star Wars: The Last Jedi banner and it uses this to familiarize readers with some things that will be seen in the film. Readers are taken to the new planet Crait, that has been seen in the trailer and also introduced to Amilyn Holdo who will be a Vice Admiral in the Resistance alongside Leia. The story also helps in building the character of Leia, showing why she would be able to recognize the danger the First Order presents to the New Republic and be willing to do whatever it takes to stop it. Crait and Vice Admiral Amilyn Holdo from The Last Jedi. Claudia Gray has already written two of the best books in the new canon with Lost Stars and Bloodline. Leia is not quite at that level, but it’s still a good book. The best thing any tie-in fiction can do is to enhance your viewing of the films or show it’s connected to and Leia does just that. In reading this book, you’ll never watch A New Hope in the same way again. Gray’s coming-of-rebellion story for Leia is wonderful and worth the read, especially before The Last Jedi. Leia is rated 4 out of 5 lost stars. This entry was posted in Book Reviews, Books, Star Wars, The Last Jedi, Uncategorized and tagged Book Reviews, Books, Claudia Gray, Journey to Star Wars The Last JEdi, Leia Princess of Alderaan, Star Wars, Star Wars books on September 16, 2017 by mrushing02. This review originally appeared on The StarWars Report. Listen to The 602 Club review here. In the lead up to The Force Awakens, the anticipation for the new filmwas palpable. Fans were atwitter about everything they were seeing in the trailers, toys and through the media, including one of the most striking new characters–Captain Phasma. This chrome-plated stormtrooper had many fans asking questions about who she was, where she came from and just how awesome she would be in the movie. It’s not an overstatement to say that she was a letdown in the film as she was given nothing to do other than be thrown into a trash compacter by Chewie, Han, and Finn. Fortunately, the rehabilitation of Phasma has now begun. She’ll be back in Episode VIII, she’s starring in her own comic (where she’ll escape Starkiller Base) and her backstory has finally been revealed in the latest release from Del Rey by Delilah S. Dawson. Phasma is an enigma, not only for fans but also for the rest of the characters in the latest book. She jealously guards her secrets about where she comes from and who she was before arriving with Brendol Hux at The First Order after helping him escape her home planet of Parnassos. This story offers a character study in who the “real” Phasma is. In The First Order’s efforts at training children they have “rescued” and molding them into a stormtrooper corp, Cardinal has been acting as Brendol’s right-hand man. This all changes when Phasma arrives and he is demoted to training only the younger children while Phasma is given control over the cadets from their teens to graduation as troopers. A mistrust grows between Cardinal and Phasma in response to this turn of events. Spurred on by his misgivings about her, Cardinal begins digging into Phasma’s past to uncover exactly who she is and if she can be trusted. What he finds will change his life forever. Cardinal captures Resistance spy, Vi Moradi, who has been hot on the trail of Phasma’s history, and forces her to reveal what she knows of The First Order’s “perfect” solider. Vi Moradi’s story exposes the heart of who lies beneath the armor. Phasma is revealed as the embodiment of Darwinian ideology, survival of the fittest. She knows who she is, a stone-cold dealer of death, and no matter who gets in her way, she is determined to survive. Phasma adheres to no other belief system than her own survival, which is her highest ideal. As Vi weaves her tale, Cardinal realizes that Phasma is a user not a believer. She constantly looks for the next best thing to further her existence; as long as it benefits herself,that’s what she will side with. Phasma proves time and again that she will turn on those “closest” to her if it means bettering her position in life. The most interesting thing to see is how even on Parnassos, where survival is about being the fittest, Phasma’s approach to life is viewed as an aberration. Her supreme selfishness and lack of care for others shocks those she lives with. Phasma is comfortable with who she is, yet she knows that the rest of the galaxy does not share this opinion, so she covers up her past. She makes sure that everyone she betrays ends up dead, unable to tell the truth, and in doing so, creates her own reality. Phasma truly exists as only what she allows people to believe her to be. She has exchanged the truth for a lie and that lie has become her “truth”. So far, we have been shown very little about The First Order in the sequel trilogy, and luckily, Phasma lets readers get a peak behind the curtain. The character of Cardinal demonstrates just how committed the Order is to creating an army that will do its bidding, no matter what they are asked to do. Children are taken at a very young age and brainwashed through training, conditioning and subliminal messaging permeating every single moment of their lives. In The First Order, there is a clear distinction between those who are in power and those who are not. The First Order and its troopers are a dark mirror for the Jedi Order in many ways. The Jedi took children to the temple with the permission of their families andraised them to adhere to the Jedi Code, a philosophy which taught them to free themselves from familial attachments so that they could best serve the needs of the Force and others. Conversely, The First Order takes children in order to indoctrinate them to think and act only according to the dogma of the Order. It squashes all of the humanity out of them, leaving only automatons to be wielded as those in power see fit. This is groupthink at its most dangerous. Delilah S. Dawson’s Phasma is a deliciously chilling character study. Its revelations about the character and the nature of The First Order make it a perfect read going into The Last Jedi. The prose is well done and the creation of Cardinal is something that will leave the readers wanting more of him as well as Vi. Phasma is rated 4 out of 5 downed Naboo yachts. This entry was posted in Book Reviews, Books, Star Wars, The Force Awakens, The Last Jedi, Uncategorized and tagged Book Reviews, Books, Delilah S Dawson, Phasma, Star Wars, Star Wars books, The Force Awakens, The Last Jedi on September 9, 2017 by mrushing02. This blob was originally posted on NJOE.com years ago and I just came across it in my old documents. Thought I would post it here as nostalgic Star Wars reading. The Jedi had been a force of peace and justice. As Mace Windu says, they were keepers of the peace – not soldiers. They stood the test of time and conflict and helped shape the galaxy; then war came. The Jedi were thrown into a role that they did not belong to. They were forced into morally compromising situations and made to choose the lesser of two evils. The Clone Wars created a cloud, along with the dark side of the Force, to ensnare the Jedi into become soldiers, not keepers of the peace. As war went on, it claimed many Jedi and not just their lives, it began to eat at the heart of the Order. They lost sight of what was truly important and became slaves to a failed government, instead of following the Force. In the end, as history shows, all were lost but two (there may be more that George has not reveled yet). 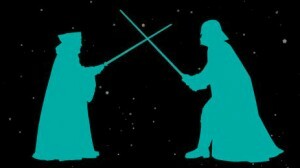 Obi-Wan Kenobi and Yoda bridged that divide to raise up a new Jedi Knight to restore peace and justice to the galaxy. Luke Skywalker has been questioned of late. His characterization is said to be off; it is said that he is no longer that “farm-boy” that we all know and love. He seems cooler and less willing to trust and look for the good in people. Is this the case and is it really uncharacteristic? Luke has not had an easy life. His aunt and uncle murdered, his hand cut off by his Sith father, and almost electrocuted to death by The Emperor. His training was woefully short as a Jedi, he fell to the dark side for a while… and then there is an endless list of super weapons, warlords, madmen and women that he had to face, Sith, kidnappings of family members, the loss of many loves, the loss of close friends, the death of his youngest nephew, the loss of his oldest nephew turned Sith who was taken down by his niece, and the death of his wife to his nephew-turned-Sith. All of this is surrounded by, and couched in, over 40 years of unrest and war with one group after another. All while trying to find the New Jedi Order’s place in the New Republic/Galactic Alliance. This man is lucky to be alive, let alone sane. “There is no emotion, there is peace. Luke has been battered by the galaxy. Yes, he was that optimistic farm-boy and still is in some ways. Yet, as the years have gone by, he has changed. He is more reserved and cautious. His desire to trust everyone has gotten him into trouble more times than he can count, so he has tempered it with wisdom and discretion. A person cannot be expected to be the same after more than 40 years of conflict, war and death. Just because Luke is a Jedi does not mean he is immune to the pain and anguish that the galaxy has to offer. If Luke was still just as naïve and wet-behind-the-ears as he was in the films, he would be the worst written character ever. But the Luke of Return of the Jedi is much more mature than just a few short years ago. His experiences molded him and honed his character, and they continue to do so throughout the books (even if he does get a little whiny now and again). Jedi are the guardians of peace in the galaxy. Jedi use their powers to defend and to protect. Jedi respect all life, in any form. Jedi serve others rather than ruling over them, for the good of the galaxy. Jedi seek to improve themselves through knowledge and training. Knowledge that is molded by nothing is dangerous. Another major complaint leveled at Luke was his mistrust and (some say) mistreatment of Vestara Khai. They point out that Luke saved Vader from the dark side, so why could he not have some faith that Vestara could perhaps follow on that same path. Darth Vader is a very different person. He was not raised evil or Sith – he was a boy, a kind and gentle boy who “….knows nothing of greed.” It is this that makes The Phantom Menace so important. It lays the foundation for why Anakin could be turned in Return of the Jedi – he was never fully evil to begin with. The same argument can be made with Kyp Durron. Again he was not evil, but possessed by evil and made to do terrible things. Vestara is a very different character than these two. She is raised her whole life to be a Sith, to live according to their code and cherish their values. A lifetime of teaching is not easily, if ever, undone. Unlike Vader, which Luke can sense good in, Vestara can never truly be read by Luke. Her core being is concealed in the web of lies that she spins and truly believes. Yes she loves Ben in her own way, and is attracted to certain aspects of the Jedi way of life, yet she is never able to let go of her attachment to the Sith way of thinking. In the end, her very way of thinking is antithetical to the Jedi code. She is unwilling to sacrifice her attachments and, in true Sith fashion, is willing to give up vital information to save herself instead of lay down her life for others. So, is it cold and unfeeling for Luke to be wary of someone like this, especially when his own son is involved? Has Luke not just had his nephew fall to the dark side and seen the repercussions of that on his son, his wife and the galaxy? How could Luke be anything but cautious and circumspect of this Sith teenager? This is not callous, it is wisdom born of over 40 years of hard learned lessons. There are many things that Luke needs to change and he has many mistakes to try and rectify. The first is being tied to a government. Luke has already begun down this path; he has removed the Order from Coruscant and set it up elsewhere. This is a wise move and it detaches the Jedi from the government in a good way, enabling them to focus on the Force and not the political machinations that are always swirling about. What is right is too big to be attached to any one form of government. The second issue is the lack of training structure in the New Jedi Order. This was one of the things that the old Order did well. It had a very regimented and thorough program to train Jedi and guide them in the wisdom of the Force. Luke needs to be more hands-on in the shaping and training of the Jedi, as do the other masters. Good training and wise teaching are essential in raising up strong future Jedi. As can be seen throughout all of the Star Wars timelines, knowledge and power without wisdom has deadly consequences for the galaxy. There is also the issue of Luke holding fast to these visions of the “future.” Yoda said, “Always in motion is the future.” Luke should be careful to not hold fast to these visions as gospel and instead be looking to the Force and focusing on the here and now. Being preoccupied with the future has never worked out well for the Jedi – just ask Zayne Carrick. The biggest problem with knowing the future, though, is that Luke is being forced down a certain path because of the Legacy comics, creating a huge problem in allowing the story to feel organic or true to this axiom of Yoda’s. The last thing to mention (even though there are many more) is that Luke needs a timeout. Like Obi-Wan and Yoda, Luke is in need of some space to contemplate his actions and the effect that he has had on the universe. He needs to be able to reevaluate the course of the New Jedi Order and rethink his role in it. All of the conflicts and wars have left Luke very little time to do any this and he has had the weight of the galaxy riding on his shoulders for far too long. There are many foes that are still lurking in the shadows and to face them, Luke needs a gut check. Who is he? Who has he become? What can he learn from his successes and, more importantly, his failures? Where has he gone wrong in the first place? Has he lost too much of his optimism in light of the ever encroaching darkness? Here’s to hoping that the authors of Luke’s future will give him the time to rest and take it all in. If a person always has to react to a new crisis without the time to process the last, they can never truly learn and grow. If given this time Luke may be able to become an even better Jedi and man for the galaxy; so lets give the man a break and let him go pick up some power converters or a good cup of caf at Cafbucks. This entry was posted in Legends, Luke Skywalker, Star Wars, Uncategorized and tagged Legends, Luke Skywalker, Star Wars, Star Wars books on May 12, 2017 by mrushing02.